Solar animation automatic alignment tool - imgalt - SolarChat! 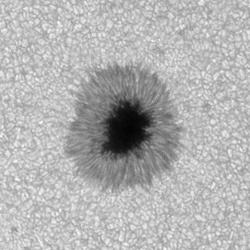 New solar imaging season has started and I'd rather avoid the least pleasant aspect – manual alignment of tens of time-lapse animation frames. Fortunately I've recently found an elegant algorithm (http://en.wikipedia.org/wiki/Phase_correlation) for detecting image translation, which can be widely varying, the images severly cropped, in other words – exactly what we get after a few hour solar session with telescope buffeted by wind, drift due to imperfect polar alignment and lack of manual correction in time etc. I've created a tool implementing this approach, and so far results are satisfying, both for white light and H-alpha. Detailed usage description and building instructions can be found in the README file. Binaries and source code may be freely distributed and used for any purpose. - crop (select area, Image->Crop to Selection, this crops all layers), equalize layers' brightness if needed etc. If you have frames in format other than BMP, they can be quickly mass-converted in IrfanView (File->Batch Conversion/Rename...). If you only have an animated GIF you'd like to reprocess, it can be split into BMP frames in VirtualDub (open the GIF, then File->Export->Image sequence...). Good stuff! Thanks for this. I have roughly looked into the source code, I wonder why using the last frame as reference rather than the first frame as reference? Actually no single frame is used as reference. Translation is always detected between two subsequent frames. Indeed, the translation vector for n-th frame is always stored with respect to the first frame, but that's just for knowing what's the bounding box of all (translated) frames in the end. Then, on the second pass, each frame is loaded again, translated and padded to have the size of the bounding box. (In the next update I might add an option to automatically crop all images to the smallest common area instead of padding). SUNTASTIC animation ...great job !! Hi GreatAttractor, what I mean should be "last / previous processed frame" vs. "first frame of the whole sequence". I can see some shift in one of your demo animations, which should be caused by the current algorithm, can this be solved by using the first frame? Or the rapid change of solar surface will destroy the accuracy of alignment by using the first frame as reference only? do they have to be BMP files - can the software handle Tiffs and jpegs? You're right, I think that if I tried to find the translation always with respect to the first frame, the shifts would be even worse - due to surface features changing. I will be testing some other ideas for better alignment though, perhaps a second pass with "block matching" or another phase correlation on a small, most contrasty fragment. Only BMPs, I wanted to keep the file-operating part small and w/o dependence on ext. libraries. (I might add them some time later). But you'd still need to end up with 8-bit depth for final publication. Of course, you do all processing in 16-bit, but then you can just use imgalt as one of the final steps. Another thought, can there be a parameter that change reference frame after every k (eg. 10) frames being processed? Maybe larger the number, less the shift? BTW, can the shift value be sub-pixel? I might try the parameter. As for detecting subpixel translation, I'm already working on it; at first to just refine the current 1-pixel translation, later I'd like to add a true subpixel translation (with neccessary interpolation) of output images. Coming soon: reading and saving of 8- and 16-bit TIFFs (not compressed). 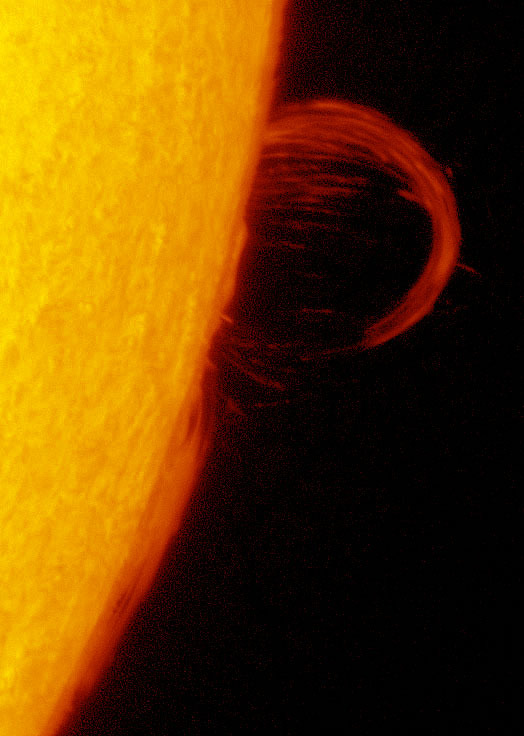 Coming not so soon: subpixel alignment and "stabilize using the limb" mode for prominence and limb sunspot animations. Good job! This looks like a very useful tool. Mark, perhaps this thread could be now moved to the Solar Reference Library section? New version 0.5 of imgalt can be downloaded from http://stargazerslounge.com/blog/1400/e ... 54-imgalt/. New feature: sub-pixel alignment. Processing time is unaffected (sub-pixel translation is deduced from the data that was already calculated), though saving of output images takes a bit longer. The difference in alignment is not huge; the output is still fluid frame-to-frame, however the long-term "drift" of the image is somewhat reduced. Sub-pixel alignment can be disabled by using --no-subpixel parameter. Also, is it possible to give users permission to reply there? I intended that thread to be also a place for any features/issues discussion. Thanks for the update, and thanks for sharing on solarchat! Merged as requested, as far as I can see replies are active - well I can - can other people?